Lest you forget. 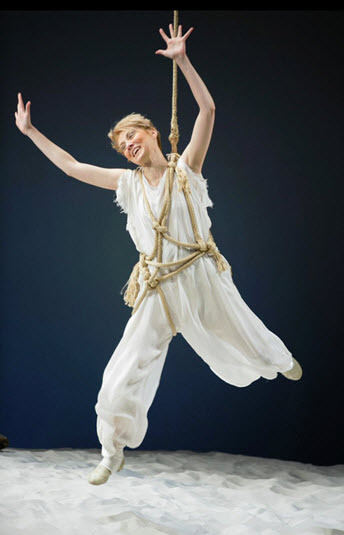 Ariel is the feisty sprite in The Tempest who flits around doing Prospero’s bidding. And yes, here she flies, though aided by what appears to be a ship’s thick mooring line. In a way, it’s refreshing to have it be obvious, unlike an aerialist’s metal wire that reveals itself from time to time. Once you’ve gotten accustomed to it, it seems natural. As if a floating fairy might be considered “natural”! As you’ll recall Prospero (Geraint Wyn Davies), the former Duke of Milan, is endowed with magical powers and charges Ariel and her gang of harpies with fulfilling all of his commands – – from the murder of his brother, Antonio (Gregory Linington), who stole his dukedom while he was lost at sea, to assuring the love match of his daughter, Miranda (Rachel Mewbron), and her paramour, the smitten Ferdinand (Avery Glymph). “They are both in either’s powers,” Prospero brags upon their first encounter. All this makes Ariel a very busy little spirit who must also oversee her cohort Caliban (Clifton Duncan). Once the proud owner of this island of Sycorax, he has been reduced to a firewood gatherer by Prospero. Sofia Jean Gomez plays Ariel, a hissing, clawing spitfire, with a duplicitous vulnerability. “Pardon, Master, I will do my spriting gently,” she assures Prospero, hoping to gain her freedom through obedience. Director Ethan McSweeny presents us with a spare sand-drenched set adorned with a single shipwreck. This bold arrangement allows the playgoer to more fully absorb the characters’ relationships in this lightened up script of Shakespeare’s final play, though the stripped down interpretation yet gifts the audience with all the humor, skullduggery and romance the play affords. 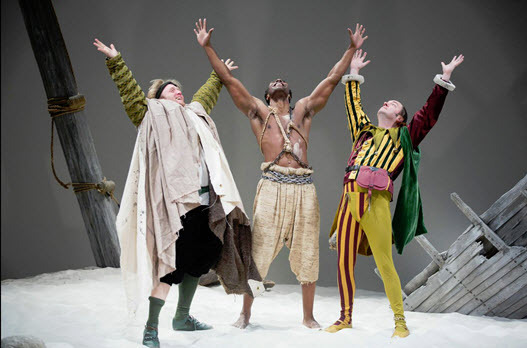 And although there is plenty of bloodthirsty treachery plotted by both the duke’s brother Antonio and his coterie of royal thugs, there is much lighthearted whimsy to enjoy especially when Trinculo (Liam Craig), portrayed as a hapless jester, and Stephano (Dave Quay), a hilarious drunk, pair with Duncan to create a total riot fest in a classic scene of mistaken identity – – if you can mistake three men under a gabardine cloth for a spider. Meanwhile the lords are plotting, as embittered royalty is wont to do, to murder Prospero. But the Sorcerer’s magical powers prove too strong to overcome and Prospero drugs the lords. “What’s past is prologue,” Antonio reminds us. 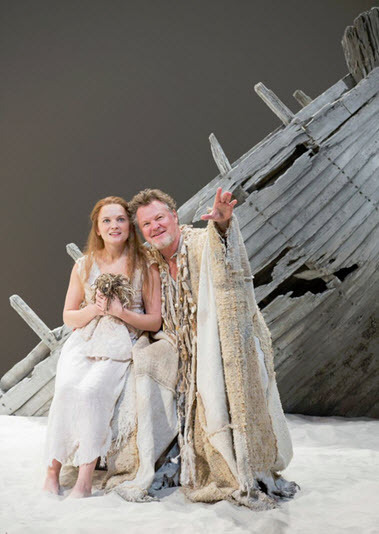 Adding to McSweeny’s vision Sound Designer Nevin Steinberg conjures up some jaw-dropping audio, producing a tempest filled with such thunder claps you’d be pardoned if you thought the entire theater might succumb to a roiling sea. Lighting Designer Christopher Akerlind augments the storm’s ferocity with a few masterful tricks of his own. 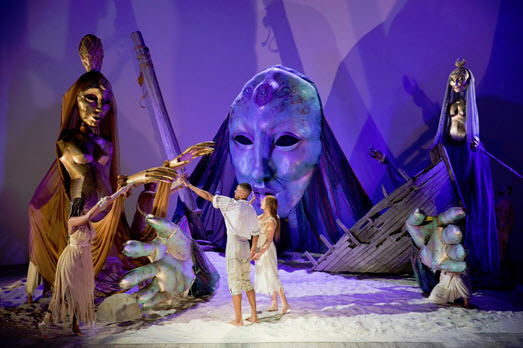 When at last our two lovers are joined Designer James Ortiz imagines the joyful goddesses Juno, Ceres and Iris as giant, diaphanously draped puppet masks, bringing to mind the fantastical puppetry of Julie Taymor, known best for her imaginary creatures in The Lion King. Through January 11th at Sidney Harmon Hall, 610 F Street NW, Washington, DC 20003. For tickets and information contact the Box Office at 202 547-1122 or visit www.shakespearetheatre.org.